Did you know you could increase visits to your website by 55% without spending a dime? Consider this: Companies with an active blog find that their webpages are indexed (ranked by search engines) nearly 434% more often than companies without a blog. There’s incredible SEO value for an active blog, but where do you get started? It may be easier than you think. 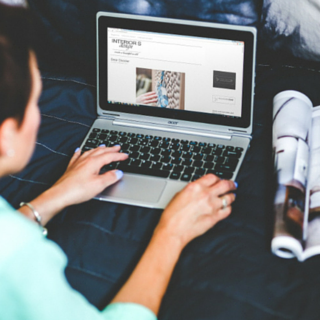 Read on for a few simple tips to help you launch an engaging, lead-generating blog. Find a Host. The most important thing to remember about setting up a blog is that it must be hosted under your main website domain. Why does this matter? Domain names are a significant factor in SEO ranking. If the content for your blog is not directly linked to your main website, you won’t get the credit for it. Here’s an example: if your website URL is www.example.com your blog address should be www.blog.example.com or www.example.com/blog for the best SEO results. Don’t be afraid to ask for help with the technical set up. Many website providers, ARI included, will assist with domain registration or set up for a new blog. Do you have a host picked out? Popular options include: www.wordpress.com, www.blogger.com or www.weebly.com. Browse your options, explore functionalities and be sure to pay attention to each host’s policy on domain set up. Find Your Voice. Once you blog is set up, consider the type of content you want to share. Blogs are powerful tools because customers feel like they’re authentic and can give insight they won’t find on a company’s website. In fact, nearly 81% of U.S. online consumers said they trust information and advice from blogs. So, what topics will feel authentic and still provide value to your customers? Consider sharing service tips, product reviews, industry news or in-store updates. Use the questions your customers ask while shopping to inspire your posts and connect with brands on social media for the latest trends. Add a customer-focused spin to all of your content. Find Your Audience. As you begin to write engaging content, you’ll find that organic traffic may arrive without much effort on your part. With that said, there are proactive steps you should take to let customers know your blog is up and running starting with a push on social media. Once you’ve published a blog post, grab the URL for that individual post and head over to your social pages. Add a personal caption to the social media post and encourage folks to read your latest blog! Many blogs will provide analytics to help you understand how your blog readers are arriving and better help you share in the future. Another added perk to social sharing? It’s free as well! Blogging is surprisingly easy and the ROI is undeniable. If you’re interested in some tips or help from the ARI Digital Marketing Services team on managing your blog, reach out! Interested in learning more about SEO and other ways to boost website traffic? Explore our full library of HelpForce Blogs.